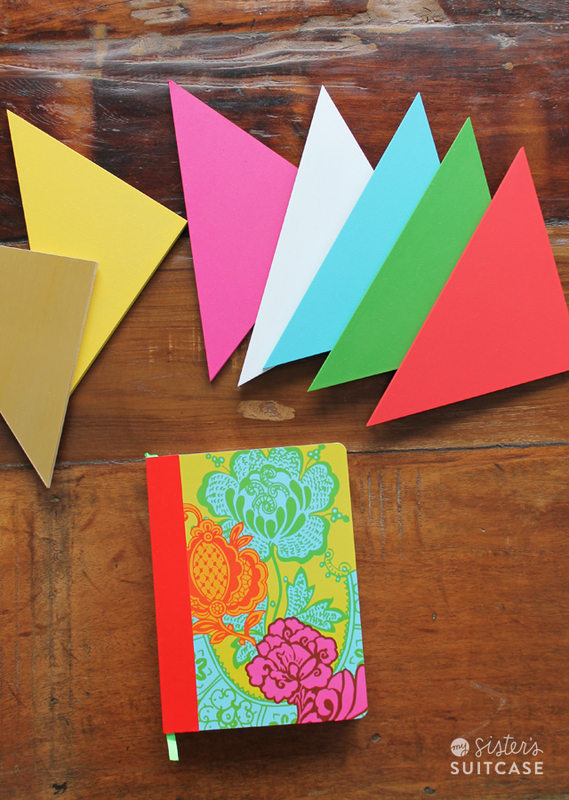 My color inspiration came from this beautiful journal by French Bull. I found it at Michaels, and I was immediately drawn to this color combination. It is so vibrant and full of life! Just what I needed in my living room. 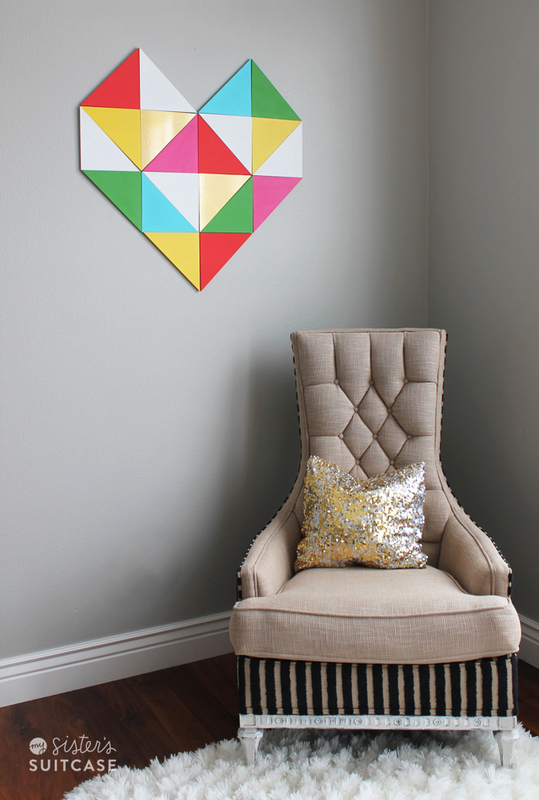 One of the simplest ways to bring a new color scheme into your decor is with an art installment. For the focal point of my Valentine’s decor I decided to create a large 3-D heart wall treatment. You may remember my wooden hexagon wall treatment…. I used the same materials to create this one. 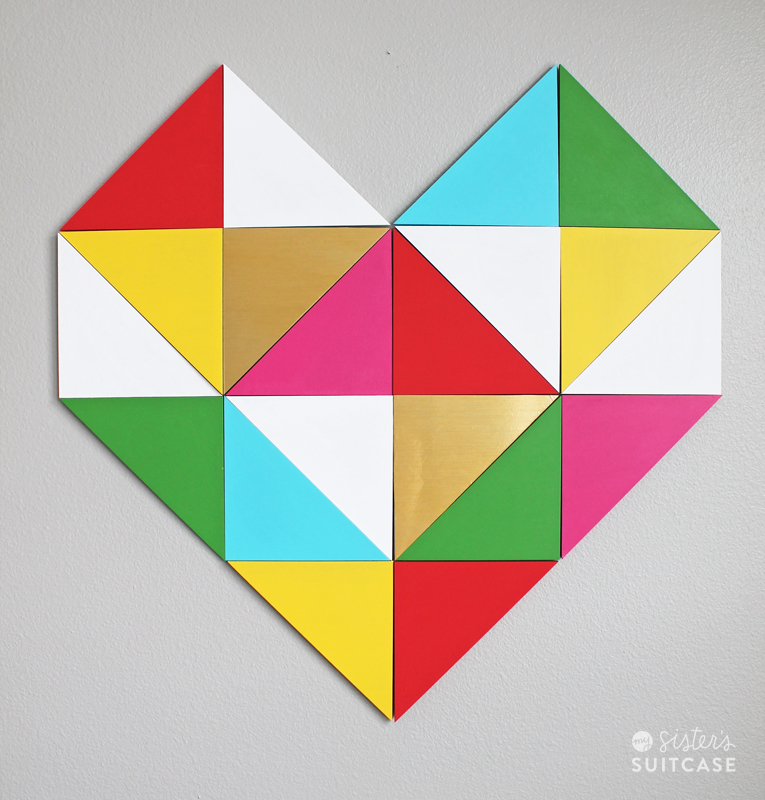 Except this time, I used 20 wooden triangles to create a large Geometric Heart design. **If you are interested in ordering these triangles, hexagons, or other wooden shapes you can visit our shop, Geometree Designs. I laid out my design on the floor and re-arranged it until I came up with a color pattern I liked. 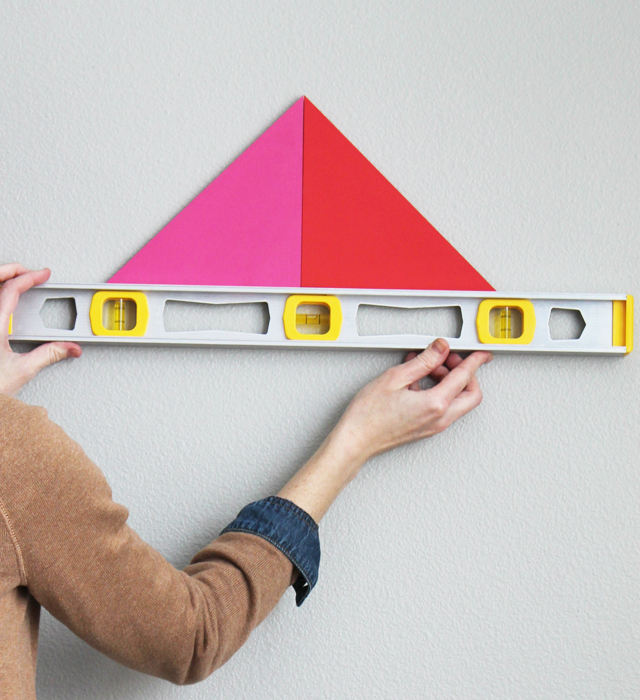 To attach the triangles to the wall, I used the small Command Picture Hanging Strips , one strip per triangle. I marked the center of the wall and applied the first two triangles from the center of my pattern. (You could also use the Large Picture Hanging Strips and cut them in half to get double the amount.) I used a level to make sure they were straight, then adjusted them before I continued the pattern. 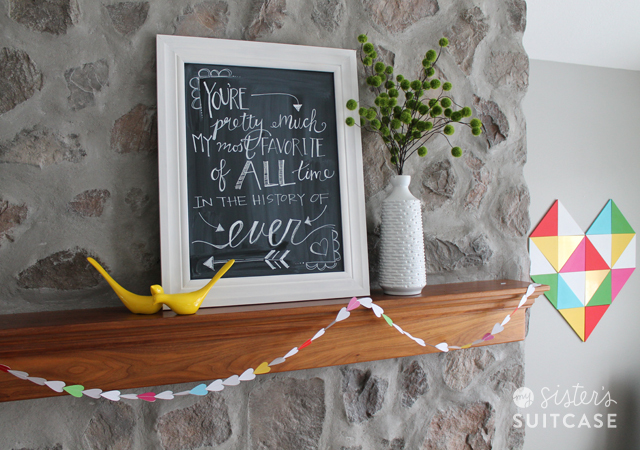 That is what I love about 3M Command strips… you can make any adjustments you need after hanging them on the wall! 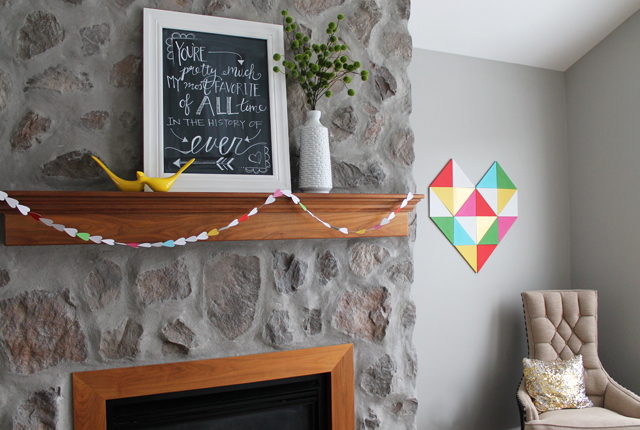 I love the dimension that these wooden triangles provide, but you could also do this with colored paper or vinyl too! On a smaller scale, I incorporated the colors with an easy paint chip project. Even the toughest-to-match-colors can usually be found in the paint chip displays at your local home improvement store. 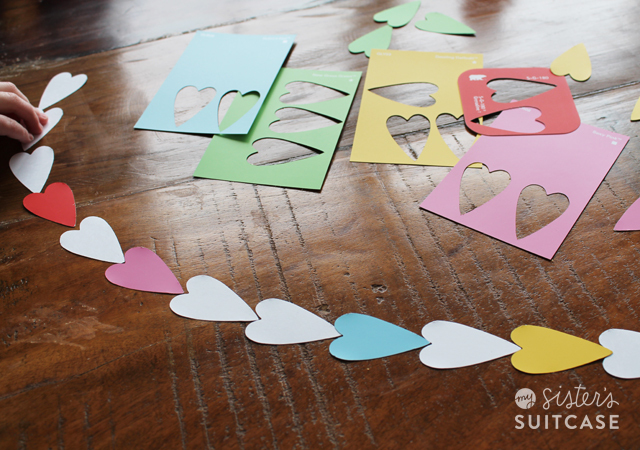 A few years ago, I created a simple heart garland from paint chips and heart-shaped paper punch. This year, I decided to attach the hearts end-to-end and simply ran them through my sewing machine with white thread. 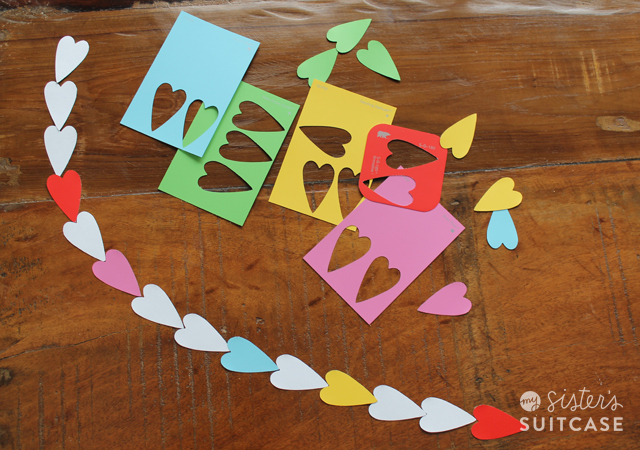 It is such an easy way to make a garland… and the best part? It was free! 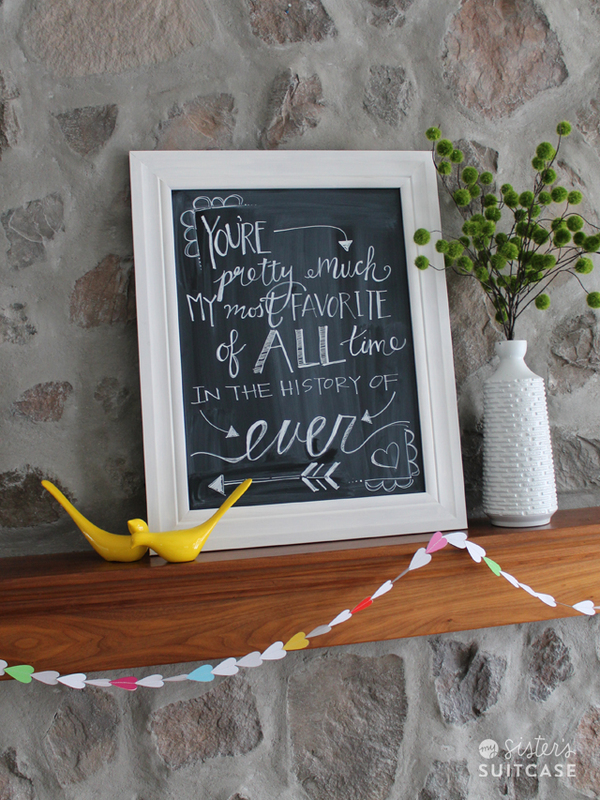 And it looks cute on my mantel, don’t you think? 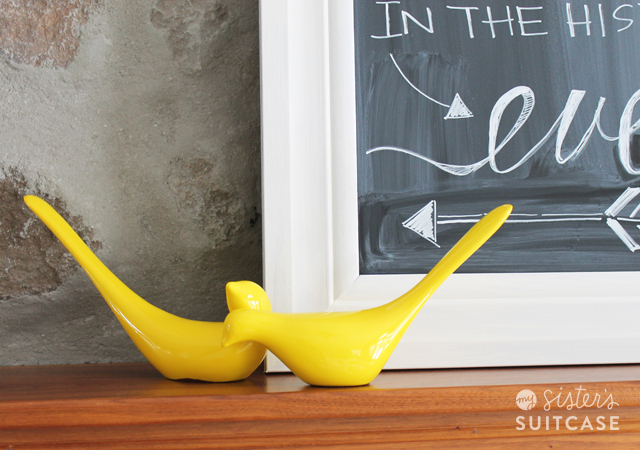 And I added these adorable yellow love birds, found at DownEast Home. My favorite store. Besides Target. I love how bright and happy this room is now! If you are stuck trying to find colors that work together in your room, find one inspiration piece that you’re crazy about, and draw your colors from there. I knew I couldn’t go wrong with the color combinations from my journal because I loved it SO much. And I was right. It’s perfect for me! Cute! 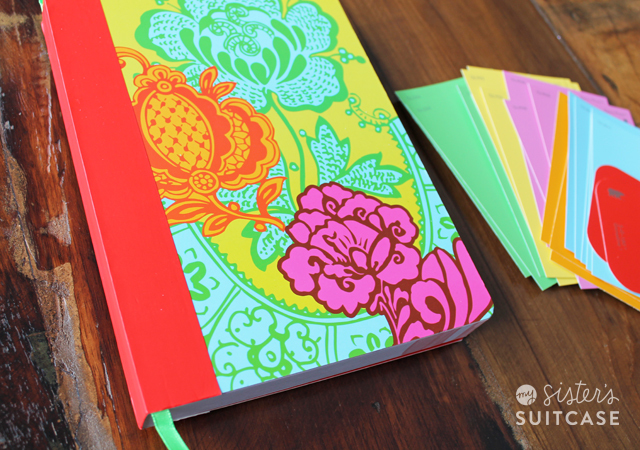 It’s so bright and cheerful and I love that it’s just paper. Love it! What a neat idea. 🙂 It looks great. Oh Holly, you are a girl out for my geometric loving heart! This is perfection! Super cute!!! Love the colors. Holly, I love the heart & the colors! The paint chip garland is so adorable. And your handwriting is beautiful! 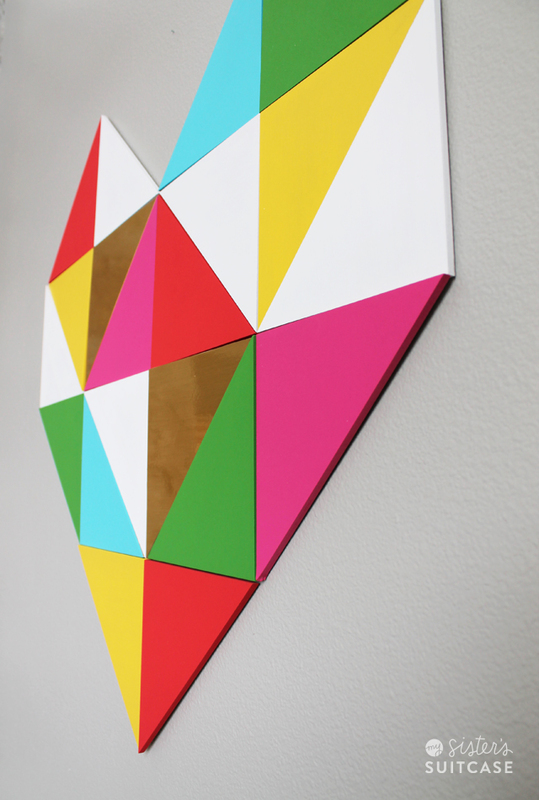 Love, love, love that geometric heart! Such a fun idea and I love the bold colors! I want to know about the chair! Where did you find such an interesting chair! I absolutely LOVE your geometric wall art. I have been looking for something that I could do that would draw attention and be easy to install. I have plaster walls and it is very difficult to hang things. This would be a great non permanent solution for a large wall above my couch. How much are they? What are they made out of and how much do you think they weigh?